Rickety Kate is a trick taking card game, but only in reverse because the object is to avoid taking tricks. Some tricks are okay to take. They are safe, but you must be careful. If you take hearts, you get points. Points are no good. You do not want points. Most of all, avoid old Rickety Kate, the Queen of Spades. She’s worth a lot of points. You do not want a lot of points. The first player to exceed one hundred points will end the game, but that only means she or he has come in last place. Rickety Kate is known throughout the world by other names as well. Black Queen, Black Lady, Chase the Lady, and Hearts, although these games can vary slightly. Like these variations, Rickety Kate uses a standard 52 card deck. Rickety Kate works best with four players, but you can also play with any other number of players. The most important aspect to preserve is that every player gets dealt the same number of cards. If you want to play with three players, remove the 2 of Diamonds and make sure each player gets 17 cards. Or you could add two jokers and give them a suit and rank, and play with 18 cards a piece. For five players, remove the 2 of Clubs as well as the 2 of Diamonds, and everyone gets 10 cards. The suits of clubs and diamonds are far less important than the hearts and spades, so if you want to shorten suits to arrive at an even number of cards for each player do so with these. You can also add jokers, but make sure you know beforehand how they play. The deal rotates clockwise for each hand. The dealer also deals the cards out clockwise. The dealer deals out one card at a time to each player in succession until they are all distributed. Once the cards are all dealt, players can look at their cards and sort them into suits and ranks. This is helpful to know what kind of hand you have. The next phase of the game involves picking out three cards to pass to your left, your right, or across to an opposite player (when four handed). You alternate these options with the fourth hand being one where everyone keeps their cards and no trades occur. In games with a different number of players, you want to use the same number of pass options as there are players so that on each hand, you have a different pass option. Examples of additional options are to pass your cards two players to the left or right. You can also remove one of the pass options if necessary. With a greater number of players, you may want to pass fewer cards. Perhaps two cards with five or six players and one card with seven or more players will work best. Keep in mind that the feel of the game changes with the different number of players. Now that you have all that sorting out of the way, it is finally time to play the game. 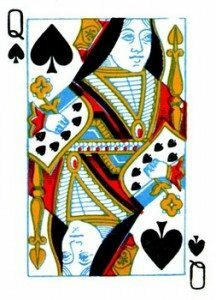 The first person to play is the player with the 2 of Clubs, or if that has been removed, the 3 of Clubs. Each player must follow suit from what is led if possible. If a player does not have that suit, he or she can “slough off” a card from another suit instead. Except for on the first trick, you can slough off your hearts or the Queen of Spades at any time as long as you are out of the suit that was led. The player who played the highest ranking card in the suit that was led wins that trick. If there are no hearts and, best yet, no Rickety Kate, that player was fortunate, but she or he must lead out the next card. Nobody can lead out hearts until the hearts have been broken, which means someone sloughed off a heart on someone else. Then lead away, but lead low or you may be in trouble. The play continues until all the cards have been played, then comes the next phase, taking score. 10-2 of Hearts = 1 point apiece. As mentioned above, the object is to have the fewest amount of points when one of the players exceeds 100 points. One variant has it that if you hit 100 points exactly at the end of a round, rather than ending the game, you can subtract 50 points from your score. The game ends when a player surpasses 100 points at the end of a round without hitting it exactly. There is another variant played in the United States version, Hearts, that you may want to add to your game, but make sure everyone knows this option is available beforehand. This variant is called Shooting the Moon. Shooting the Moon occurs when a player intentionally takes every heart and the Queen of Spades. If that player takes all but one, then he or she has failed and has to take all of those points. However, if the player succeeds, you can choose to score according to either the New Moon option or the Old Moon option. It is more fun to leave both options available and allow the successful player to decide after she or he shoots the moon. Old Moon scoring means that a total of 36 points is added to each player’s score except for the player who successfully shot the moon. New Moon scoring means the successful player subtracts the 36 points from his or her score but does not add it to the other players’ scores. The name “Rickety Kate” is a new one on me. Love it! Growing up in the UK, the names we had for Rickety Kate were “Slippery Ann”, “Black Maria” and “Pass The Lady”. Although the game is called “Hearts” in the USA, I think this is a misnomer. It’s odd not to mention the main subject of a game in its title, and in fact Hearts is a similar game that does not involve the Queen of Spades (in the UK). Thinking back, I believe we played a version where the penalty cards were the Queen of Spades, the Jack of Diamonds, and then all the hearts. Thank you for “Rickety Kate”!